The FluoroSpeed 300 Digital R/F System is designed for high performance Digital R/F and Bucky radiography. 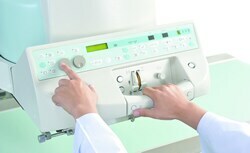 By combining the latest DR system with the YSF-300 R/F table, the system's capability is expanded to digitize the examinations from gastrointestinal to general radiographic studies of the highest image quality.Shimadzu's extensive R&D expertise has made this FluoroSpeed 300 integrated Digital R/F System reliable and flexible, meeting your clinical needs today and expanding the potential for tomorrow. The FluoroSpeed 300 was designed with both the operator and the patient. This comprehensive system not only simplifies the examination process, but also ensures safer examinations at lower X-ray dose. In combination with the CH-200 ceiling-type X-ray tube support, the Fluorospeed300 performs a variety of radiographic works. The ceiling tube mount, table and generator are integrated, providing easy positioning and setting of radiography conditions.